"Hey baby, what can I get you?" We have arrived on St Martin on a sunny August day and easily made our way from the airport to the Marigot ferry dock via a 15 minute taxi ride. 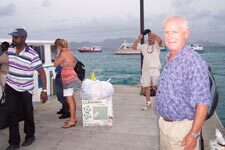 After paying our departure fees, we headed to the glass enclosed waiting room to watch for our 5:30pm ferry to Anguilla. Luckily for us there is a little snack bar there and we toast our Caribs to the start of another adventure. The 5:30 ferry arrives around 6:00 and we board the Niki V for a 30 minute ride to Anguilla. I had a great seat by the door and enjoyed the cool splashes of the sea as we made our way out of the harbor and (quite literally) into the sunset. There were certainly waves along the way that made the trip pretty bouncy, but it's manageable since it's such a short trip. On the other side of customs in Anguilla, we were greeted by the smiling face of "the famous" Wendell Connors, our driver for the next 4 days. A lot of his business is based on referrals, and I'm quite sure it's a result of his reliability and passion for and knowledge of the island of Anguilla. He has a comfortable taxi van with A/C and is available to visitors of Anguilla for taxi rides during their trip. 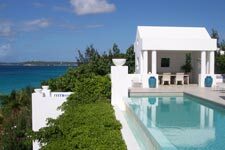 On the West end of Anguilla is Sheriva, our home for 3 nights. Sheriva is self-described as a luxury boutique villa hotel. It is more villa than hotel and one of their greatest assets is the friendly and accommodating villa staff. This was my first experience of a staffed villa, and I found it to be a very special and privileged experience. I actually appreciated it even more after we had departed as I started to miss all the small details of their service that had made my stay so relaxing and comfortable. The lovely Vivienne was the first to greet us from the steps of our villa, named Harmony, as she held a tray of cool, floral scented towels to wipe away the stress of travel and welcome us to Anguilla. Inside there was rum punch and assorted appetizers that we enjoyed poolside as we chatted with the Sheriva staff. The dinner table was already set as Santiago was busy in the kitchen preparing a lobster dinner and other tasty treats for the evening. The 3 villas of Sheriva are all within site of each other so you can’t expect total privacy when you are using the terraces and pools, and that is where there is more of the hotel aspect for this property. There is staff on-site and you will feel the buzz of other clients around the property. In the end I sensed that this property would have a really fun atmosphere when several guests are on property. The villas are not beachfront, but in just 3 minutes you can be down to the very beautiful beach at Cap Juluca in your own personal golf cart. As a guest of Sheriva you are welcome to use the Cap Juluca beach as well as their restaurants where you will have signing privileges. Our first full day in Anguilla happened to be the last day of their Summer Festival, a big celebration on the island. They close the festival with the Champion of Champions Boatrace and a fireworks display at Sandy Ground. The party was hopping when we got to Sandy Ground. There were a few shops and restaurants lining the beach, and then there were dozen of trucks and tents selling regional foods. 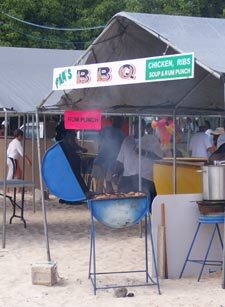 Each tent had a BBQ grill cooking up ribs and chicken, a radio blasting music, and some cool drinks for sale. For just $15 we were able to rent 2 chairs and an umbrella and we just enjoyed the atmosphere and our first dip in the Anguillian seas. 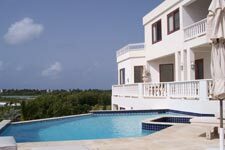 We visited several villas and hotels on Anguilla. The island offers a great selection of luxury accommodations, ranging from classic to elegant to over-the-top! Some of the highlights were the Cuisinart hotel which is set on a beautiful beach and is undergoing an expansion that will add condos, villas and a new fitness/spa facility. This is a great property for food and wine lovers with the on property hydroponic farm, fruit gardens, 3,600 bottle wine cellar, and Kitchen Stadium which offers gourmet cooking classes. Then there is Covecastles set on a lovely beach at the most western end of the island. The villas here are very private and have a calming natural feel, great for quiet getaways. The larger villas are also great for groups, and in fact they had just had a party of 10 girlfriends traveling together for a week in the 5 bedroom villa. Just down the beach is Altamer, which I think falls into the over-the-top category. The 3 villas have tons of personality and offer a terrific atmosphere for vacations centered on special events between large families and groups of friends. The African Sapphire villa had just been host to a wedding where the bride rode in on a horse! In the elegant category is certainly Temenos, a St Regis managed property. Guests here will stay in one of 3 villas named Sand, Sky, and Sea and will enjoy the finest furnishings, surroundings, and service. And don’t forget the drama…the gorgeous water views and one of the most incredible bathrooms that I've been in, complete with an electronic privacy screen between the indoor and outdoor portions of the bathroom.